Explicit public expressions of the gospel in popular culture are few and far between. We just do not see many public examples of the apostolic faith these days, and this scarcity is probably the reason behind the relative ease with which Christian belief can be caricatured in movies, television shows, and new reports as prudish, ignorant, reactionary, and angry. Such a portrayal of Christian community is so common, in fact, that I am afraid many Christians believe it themselves despite their daily experience to the contrary. Group-think packs a nuclear punch. Every once in a while, however, the light shines in the darkness, and the darkness cannot comprehend it (to borrow image and language from the apostle John). Last winter, for instance, the world was horrified by reports that twenty-one Egyptian Christians were marched onto a Mediterranean beach and beheaded by ISIS henchmen. The Christians wore prison jump suits though they were innocent of any meaningful crime, and the name of Jesus Christ was on their lips as they shed this earthly life like a garment. Their martyrdom, which itself means “witness,” refracted around the world as news outlets told and retold the story, and, in the light of their public faith, the darkness of the horrific event seemed to dissipate, even if just for a moment. Light is not only about proclaiming the good news of Jesus Christ, it is about being present. We tend to do proclamation well in the evangelical world, but when we do, we often shout the truth from afar and shake our heads when others don’t listen. To be light, however, we need to be present. We need to be in the places where the darkness has a foothold. We need to be in the room when darkness makes its advance. Jesus said he didn’t come for the healthy but for the sick (Mark 2:17), so we need to ask ourselves, are we seeking out the dark places of this world so that we can shine the floodlight of the gospel into them or are we standing on a faraway hill, cupping our candlelight in the wind? 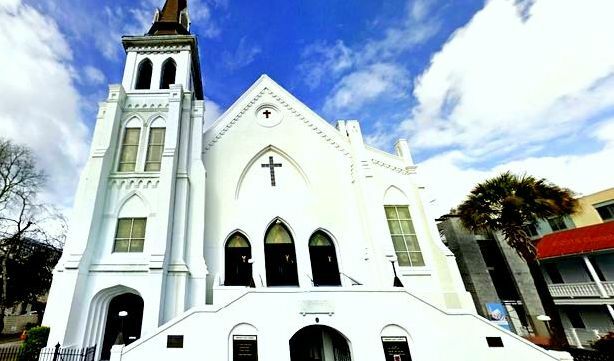 Sometimes the darkness comes to find us, as it did last Wednesday night, when a racist and hate-filled young man stood up during a prayer gathering and opened fire on the assembled believers at Emmanuel A.M.E. church in Charleston, S.C., killing nine people in cold blood. Doesn’t that sound like darkness? Doesn’t that sound like an oppressive, blinding darkness that pierces the soul when you hear news of it? During a bond hearing last Friday, some of the relatives of the victims of the attack addressed Dylann Roof, the young man who confessed to taking away their loved ones forever. They were short and to the point, but their statements have elicited an remarkable response from those who have heard them. In response to such statements, many were dumbfounded and confused. What could cause someone to say such things to the person who took their loved one two days before? How does a person speak like this? How do we explain such extraordinary grace in the midst of such heart-breaking suffering and loss? That is what light in the darkness looks like. This is the lived theology of Jesus Christ, the light of the world, who gave himself up to the gravest injustice of human history while praying, “Father, forgive them. They know not what they do” (Luke 23:34). As these news accounts came out about their testimonies, audiences saw one of the purest public expressions of the gospel that I can remember in recent years. This is what it looks like to apply the gospel into the most difficult situations in life to the effect that the darkness of the horrific event can be dispelled, even if only for a moment. The gospel is honest about evil in the world and in the human heart. The gospel exposes the truth about us, even at our worst, but it does not do that for the sake of shame but redemption. The gospel says that what happened was a great violence against God, others, and creation; it tore the soul, demeaned the image of God, propagated hateful oppression, and must be judged by God. But that judgment is executed in two ways. Evil will be judged by Christ when he comes in glory, in what is often called the final judgment, or it has already been judged on the Roman cross upon which Christ died. Roof must make amends to society for his act. This is good and just. But for those who are in Christ, there is nothing that we have done, no darkness we have nurtured, no penumbra of the soul where our secret besetting sins hide, that Jesus has not paid for in full when he took his place on the cross. This is the brilliant scandal of the cross. Christ gave himself up because we could not. His light was quenched for a moment so that our darkness could be eradicated forever. The gospel speaks the truth about us and our evil, but it does so to redeem not to ridicule. The gospel does not say, “Let’s act like nothing happened.” It says, “It happened, but God so loved the world that he sent his only son…” In doing so, Christ became the light of the world, the light of revelation for the Gentiles and the glory of his people Israel (Luke 2:32). Those who are in him are likewise, in the light (1 John 1:5-9). The world needs to know about this light. The world needs to experience its radiance in the darkness. It is the only hope this world has.